Where to begin about Killing Commendatore? This chunkster of a book is about a portrait artist who breaks with his current life after his wife leaves him. He moves into a remote home that allows him a quiet life away from his work. Until, he discovers a hidden painting in the attic and a man offers him an astronomical sum to paint his portrait. He agrees and a tenuous friendship is formed. Then things get both unnerving and odd. Killing Commendatore is 700 pages long and I don’t disagree with those who say at least 200 could be cut. However, while Murakami writes of the minutiae of life—the details of every breakfast, each item of characters’ clothing—it’s not stultifying. There is a gentle fluidity to his writing. For me, it was a welcome respite from the breakneck pace of toxicity engulfing this country right now. And because of this I was able to put the book down for a week and not lose my place. Normally, that would count against a novel, but things these days just aren’t normal. 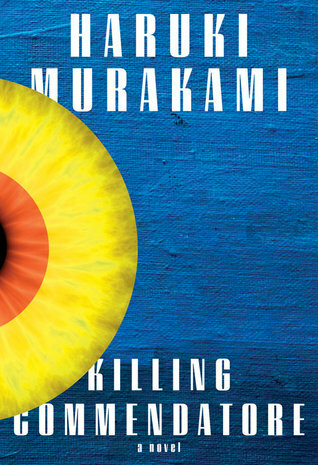 At the same time, there is a point in Killing Commendatore where, despite a setting that seems to embody serenity, Murakami introduces elements that are disturbing. An unseen bell that rings early in the morning but can’t be found leads to a walled pit 9′ underground on the house’s property. A hidden painting that once seen can’t be forgotten; a tiny man who appears and disappears. It all works so well, I reached a point where the novel felt like the movie The Ring. As if, just by reading the book, I was going to be pursued by whatever evil was unearthed. Which is all to say, Murakami embodies my understanding of Japanese art. In some ways it is very flat and one-dimensional, like traditional Japanese paintings, but it also has a sense of grace and movement. And like The Ring there is a deliciously understated current of foreboding. There is nothing in Killing Commendatore that resembles horror, but there is a lot that is scary and unexplainable. For the most part Murakami does an admirable job combining all these elements, but towards the end he overreaches a bit. The novel’s climax feels unresolved. Something happened, but why and what did it mean? All the tension is lost, leaving an odd slackness. Having never read Murakami before this may be what he aims for in his writing, but I felt cheated and disappointed. For aficionados of his work, Killing Commendatore may be Murakami at his best, but I wouldn’t recommend it for anyone else. Far too long and ultimately confusing. Well, that’s out. Thanks for vetting! Why oh why do authors still insist on 700 page books? I haven’t read one in a long time that I didn’t think could be cut down by a few hundred pages. You’re welcome! I think it would have made you nuts. Still, a part of me wonders if I should try another one of his books. I liked his writing style. Thank you! There is something lovely about his writing but this story just ended up meandering with a very unsatisfactory ending. I’m left wondering if I should try another one of his books. When I consider a 700 page book, it has to be something that really intrigues me and this one never did that for me. Had you loved it, I may have reconsidered, but I think I’m relieved that it’s one to skip! Absolutely. I’m on the fence about trying another one of his books- maybe an older one with consistently high ratings. But it will be awhile as I’m not in a place to commit to even 500 pages these days. I was still mildly curious up til the feeling of evil in pursuit! Hard pass thanks. It actually would have been better if that aspect came to fruition, but it all just fizzled out. I haven’t read this author and I dont have a big urge to read this one either. But I commend you for reading its 700+ pages. Some of it sounds interesting but perhaps not all of it. Too bad for the ending?